Bits out the Back: End of October Update, Seedlings & spice..
End of October Update, Seedlings & spice..
Well we have just finished a 2 week holiday of sorts with Bianca having a few weeks off.. I feel like we got a load done around the house as well as the patch.. The day after the last blog we got power connected to a post in the aquaponic area..This has made the whole yard a lot tidier with less cords & hoses laid out everywhere..
No longer do I have to connect 2 together to water the beds behind the chook house & blueberry in the back corner.. The hose can also reach the mulberry tree up at the side of the house..
Another jobbie that has been sorted is the backup air pump for the aquaponics for when/if the power fails.. This has given us some peice of mind but would still like to refine it further if I can scrounge some parts.. To start with, a solar charger for the battery would be great.. Would also like to try to run the 12v pump via a inverter & UPS set up but that is still being researched..
Had a bit of a scare with nutriment readings from the system this week.. The pH has dropped to 5.6, ammonia is steady at 0.5ppm with nitrites trace... The big shock was the nitrates that have spiked to above 80ppm (hard to tell for sure as I have lost the card that goes with the kit).. A few of the plants had started to yellow off a bit so I dosed the system up with some iron & upped the feed for a few days but I think it may be the acid conditions causing the yellowing off.. 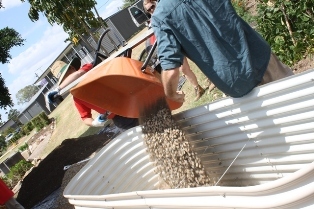 I posted an enquiry on my Backyard aquaponic forum thread & have been told it's not as bad as I thought but should be addressed ASAP... Slacked lime (also known as hydrated lime, brickies lime, Calcium hydroxide) was also suggested as a quick way to bring it up & an option I was considering, Thanks RupertofOZ.. I decided to add some shell grit to buffer/raise the pH as we already had a bag under the house that we use to supplement the chooks diet.. My mistake there was to tie a insect exclusion bag to the water inflow tap on a grow bed so the water could flow directly over the grit..
After some fish solids had collected it made the bag less water permeable & the bag swelled up over the side of the bed under the pressure.. The water had to go somewhere so it started to overflow down into a tray of pepino cuttings underneath.. At least all was not waisted &I think they all loved a good drink of fishy water.. I decided that having the water flow through the bags wasn't necessary so just tied them off & placed them in the clay directly under the taps.. I think we lost ½ the sump, about 300L, over night so that shall be replaced on Friday.. 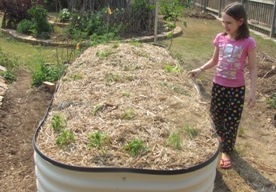 I will hold off adjusting with slacked lime until the system is topped up just to see if the the fresh water (which I know is alkaline here) will help raise the pH..
Hopefully a full clip behind the ideas of the garden & the future plans will be made in the near future..
Last week we were lucky enough to have a tall raised garden bed donated & installed by the local Bunnings store.. It was great that not only did they supply the bed, help to assemble it but also provided the gravel, soil, mulch & plants needed to get it all up & growing.. 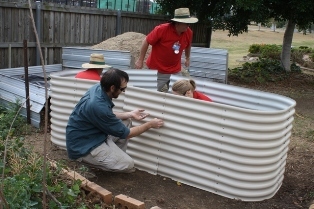 I think these raised beds are a great idea especially in a community garden.. Members of the community that have back & other mobility issues will now have somewhere where they can comfortably garden & help out.. If we could get a few more of these beds set up we may be able to encourage a few more people to participate in the garden & maybe decide to have a go at growing their own food at home.. Thought we may have lost the turmeric that we left in the ground over winter so we planted out a few more corms..
We didn't need to worry it appears as the plants in the IBC beds have all survived & sent up new shoots..
1 row of Dragon Carrots (Eden Seeds) into bed #5..
2 lots of Mini Lee watermelon seeds (BOGI) into IBC Wicking beds near the AP & house.. Planted a few of the trees we got from the BOGI fair into larger post & installed Wetpots into them I did a little clip explaining what Wetpots are & how they are installed.. I think the plants will be very happy here over summer until we finish the design for the front yard where they will be planted out.. Potted up the following seedlings that had been sitting in the trays..
1 x Blueberry bush (BOGI Fair) into Wicking barrel..
That's about it for now... Will do a harvest update for the past month when I can scrounge some time..